So, I've been battling with the side steps over the last few weeks. These were a real pain on the Trent and as the Tamar ones a vac formed I thought they would be tricky but easier. Also, I wanted to make a backing plate to run parallel to the hull sides under part 17. In the end, I replaced the kit parts 17 with 4.8mm wide styrene strip and glued triangluar pieces to the bottom to cover the void underneath. So here's a pic of the vac for parts fitted. The problem was though that the steps simply flexed too much when I was blending them in to the hull with filler. I also thought that on a working model they would not be robust enough. So, the vac formed parts were removed and I rebuild them from 1mm styrene which I'm much happier with. These are now in place and I've trimmed the cabin sides to fit. The photo just about shows the modified replacement parts 17 with the triangular blanking plates. I've now moved to work on the bow/foredeck area. I've now finished the pulpit rail, using the plastic tube and steel rod included in the kit. I toyed with using alloy rod left over from my Trent, but decided against it on balance. One obvious omission from the kit is the mini crane/hoist next to the pulpit rail. I made this using 2.4mm brass rod and 0.5mm styrene. The RNLI plans and my photos of the full size boat were invaluable for this. 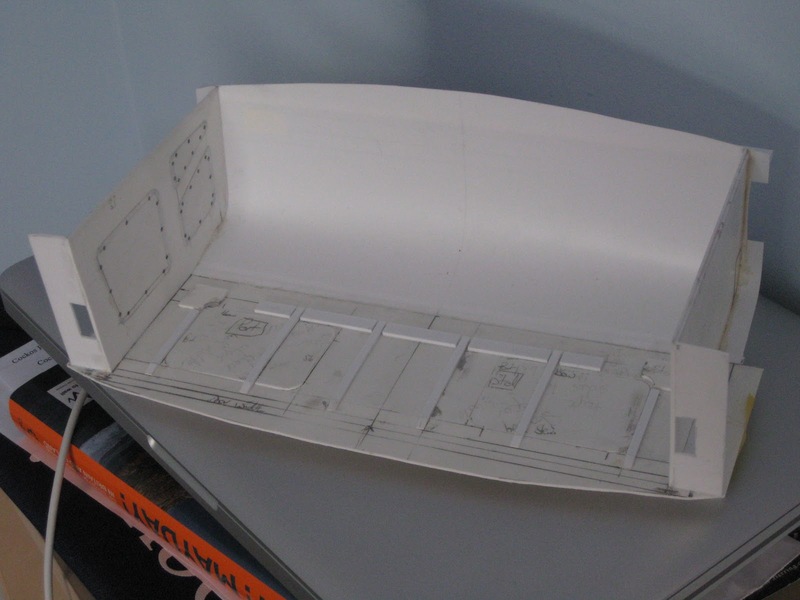 I also made the extra section of deck plate on the starboard side from 0.5mm styrene, which was also used for the front anchor housing and 1mm styrene for the crane mounting. Also, I made the bow roller. The webs on the side were angled back slightly as my photos and the RNLI plans showed this. There's no before and after shots because I think the finished but unpainted picture shows all the parts well enough. The bolt heads are photo etched from Speedline models which I'm using around the boat. Next up, I'm tackling the side steps. After a fair bit of swearing(!) 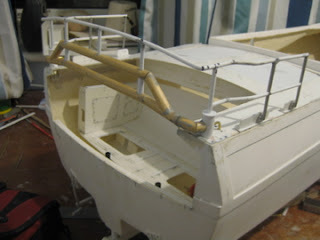 I've not finisted the transom bar and stern rail assembly. For some reason, the rail itself seemed harder than the stern rail on the Trent; even though I thought it would be easier. There are no pre-ssembly photos as you can see all the parts in the pic of the finisted item. I'm pleased with the end result though glad the railings are now (nearly) all finished. Just the rails for the flybridge now. The rails seem fairly solid, though I managed to split the transom bar and had to repair so I've slight concerns on this front. The stantions are all pinned to the top rail though due to the steel wire running through, the pins are only the thickness of the plastic tube! I found it impossible to drill through either brass or steel wire on these parts. Right, I've now finished one of the biggest challenges on the build, and also made it harderfor myself to boot: I've finished the transom bar. The first job was to seal the dowel, but mine was jagged on one side. So that took filler and time to put right. I almost bought a new dowel but my local timber merchant didn't carry the right diameter. So, with the filler sanded smooth and after several coats of sanding sealer, rubbing down each coat, it was time to get sawing. Having seen the full size boat, there is are two angled pieces at each end of the bar, not one, so I decided a modification was needed. Using the kit plans as a base, I drew the revised shape, together with cutting angles. These were worked out using the RNLI plans. I used my mitre box to get vertical cuts and held it over the drawing to get the correct angle. A tricky operation all in all. 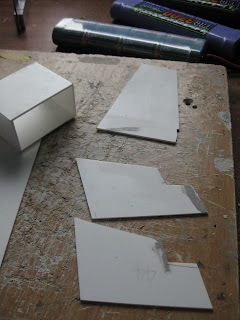 With all the parts cut, they were glued using superglue gel, fine tuning the angles where necessary with the superglue acting as a filler as well. Then the stantion uprights were added. The two uprights which pass through the top and bottom bars have a thicker bottom section so I used 4.8mm plastic tube there. Hopefully the photos show this all clearly. I've also added the deck base plates but these need a little more work. The whole of the upright at each end passes through the deck rather than just the stantion partly because that seemed easier than shaping the bottom of the uprights to fit the deck camber but mainly because I pinned the bar assemble ot the uprights to add strength and the pins stop the stantions running all the way through the uprights. I'm off to work on the other railings next. A big step forward this time; I've joined the deck to the hull. It went quite well though there was a bit of swearing and I probably could have got the fit better in places. Still, nothing a bit of P38 filler and rubbing down won't cure. I was going to wait until all of the Y-Boat compartment including the transom door opening was ready before joining the deck. Dry runs showed the compartment module would slide in afterwards though so I went for it. I also decided that with only very limited access to the rudders, through the Y boat compartment, I needed better access behind the main deck opening. 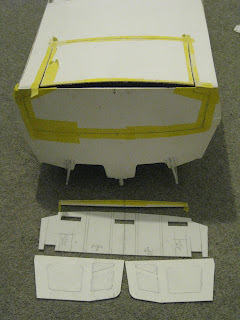 So, I've cut out the engine hatches and made removable ones from 1mm styrene. These are based on the ones in the Trent kit and have a coaming underneath which also acts as a former for the deck curve. I just need to add some thin spacers now to account for the variation in thickness of the deck moulding - so nearly there. After the filling, it'll be on to fitting the side steps. While I've been working on the dowel for the stern bar assembly; its needing lots of sanding sealer as half of the dowel was roughed up on one side, I've been building the hatches and doors. 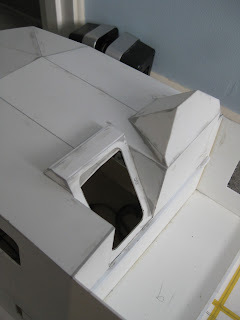 I used the kit parts as templates but remade the hatches and doors using my Trent and also photos for reference> That's because I felt 2 parts of 1mm styrene didn't look as good as using a combination of 1.5mm and 0.5mm for the doors and 1mm and 0.5mm for the hatches. The photo below shows some of the parts. Next was the fiddly job of making the hinges. Patience was the order of the day here. 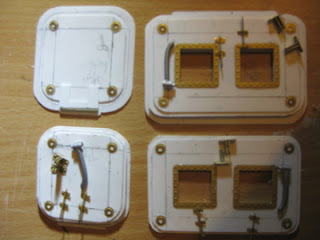 I've still not quite finished them as I've not joined the 2 halves of the hinges together yet, but I'm not far off. A little slow progress this itme but then I have been away for a week since my last post. So, I went with starting work on the railings, beginning with the side stern railings. The first task was to 'clean' up the white metal stanchions. This just involved filing down the casting seams and drilling out the holes. I'd forgotten how time consuming this can be so am not looking forward to doing this with the other white metal parts. Next up was forming the top rail into shape. I used my x-acto knife as the former for the bends. Second up was forming the bottom rail. The parts are shown below. I departed from the instructions in a couple of ways. First, I cut off the pins on the stanchions, drilled out a 1mm hole and glued in 1mm wire pins. I felt the original cast in pins were too big as whilst I could drill through the plastic tube, I couldn't get through the wire core. Secondly, rather than just pinning the bottom rail either side of the stanchions, I have wire core all the way through to add strength. 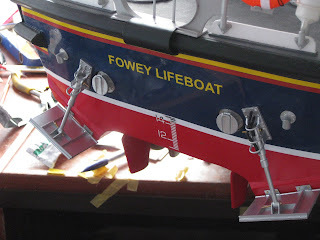 Thirdly, I cut the white metal rail ends (part T17) down to better match the full size boat using the RNLI plans as a guide. This pic shown the railing finishes all bar filling. Next up on this vein will be the transom bar and railings but first I have to prep the dowel for this. It's done, well almost. After discovering that'd I'd assemble the liferaft storage on the wrong side or part 58, the new assembly had to work, and it has. There is now space to have the full height port engine vent, which I'll scratch build soon, and all three 'storage' compartments. The Starboard compartment though will be covered eventually. I've just got a couple of cut outs to make which hopefully can be seen marked up in the photos. One will be for the radar and mast light wiring and the other for for the starboard angine vent so the floor can't be seen through the grill. 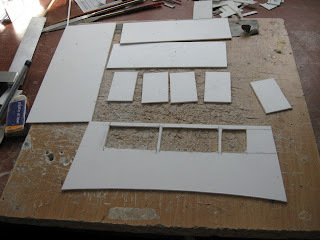 I've also been cutting out more of the printed styrene parts. From my point of view, this is one of the most tedious jobs on the kit, together with cleaning up the cast parts, but it has to be done! So I have the cabin floor cut out, the vac-form seat bases and door surround roughly cut and also the strips which lock the floor into the cabin. I'm not sure what I'll do next, I'll have to see how my mood takes me but it'll be the stern side rails, the transom railing or the cabin inside... More next time. This time, I've been working on the flying bridge as well as finishing off the roof by fixing and filling all of the joints. The cabin door entrance is now in place as is the flyingbridge steering position. The door went together very smoothly. I've cut off the roof former at this point and will also need to cut out the roof section under the door frame as both will be very obvious with the door open. The steering console was more tricky. I made several new parts using the kit parts as templates. I also altered the side pieces as they have a crease so that they are a right angles to the cabin rear at the console and then angle in. It's difficult to explain but hopefully the pics show this. 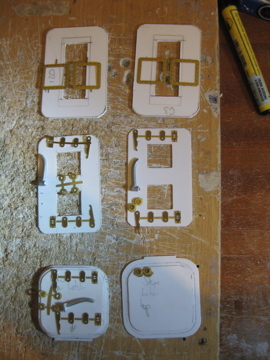 I've also cut the new parts for the flyingbridge floor and back of the superstructure. This will accomodate the longer port engine vent. I also discovered that I'd fixed the liferaft box to the wrong side of part 58 so my clever scheme on that was not so clever! I've been on hols for a week so less progress than usual and only one pic. However, I'm pleased with what I have done. The roof is now on the wheelhouse. A little filler was needed but I'm happy with the results. I still need to reinforce the inside joints. Rather than single 1mm thick strip, I'm going to use 0.5mm strip scored down the middle. One holiday related link was that we went to see a Tamar. Turns out the port engine vent runs down below the flybridge floor; it's about twice as long as the kit part. So, I'm going to order some more styrene from Squires and build an alternative flybridge floor and see if I can model it with the larger vent. If not, the kit parts are in reserve. More on that next time hopefully. I've been working on two things over the last couple of weeks. First, I've been working on the cabin lighting realising that once the roof's on, fitting lighting would be much harder. So having been persuaded by a club member to use LEDs rather than conventional bulbs, I made a trip to my local Maplins. LEDs, resistors and circuit board bought, I've soldered leads on and am half way through the whole circuit. 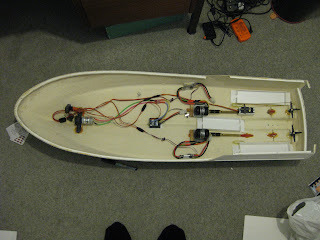 The other half can wait until the cabin is finished and I've worked out all of the wiring routing. 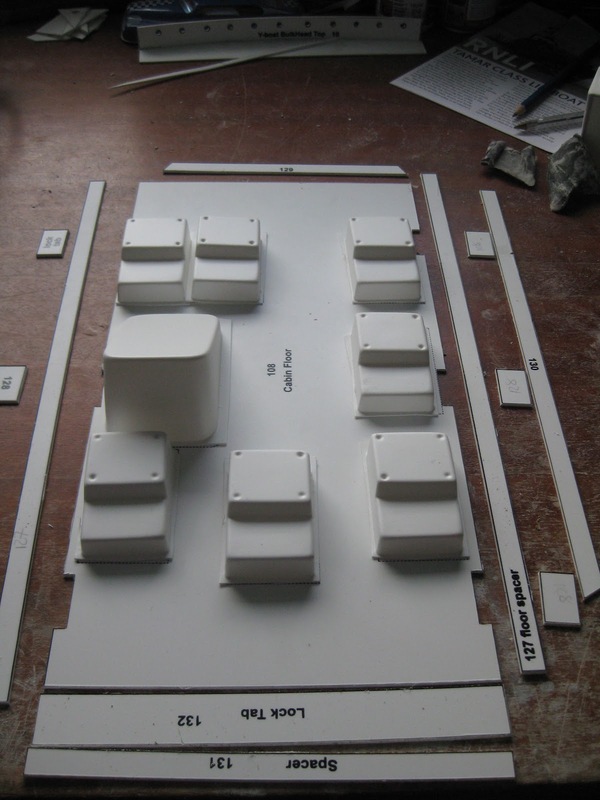 The photo shows the LED and some wiring conduits in place. This will all be painted black before the roof goes on. I've also been working on the boxes on the flying bridge (or upper steering position [USP]). 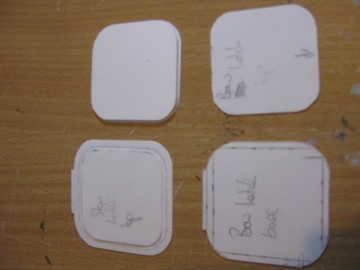 The plans I got from the RNLI show these with rounded edges which I've tried to do. 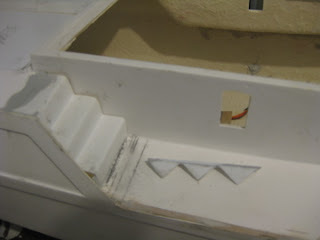 I also decided to ditch part 72 on the port engine vent box and make a replacement frame from styrene strip. This will give some depth to the vent once the grill is on. 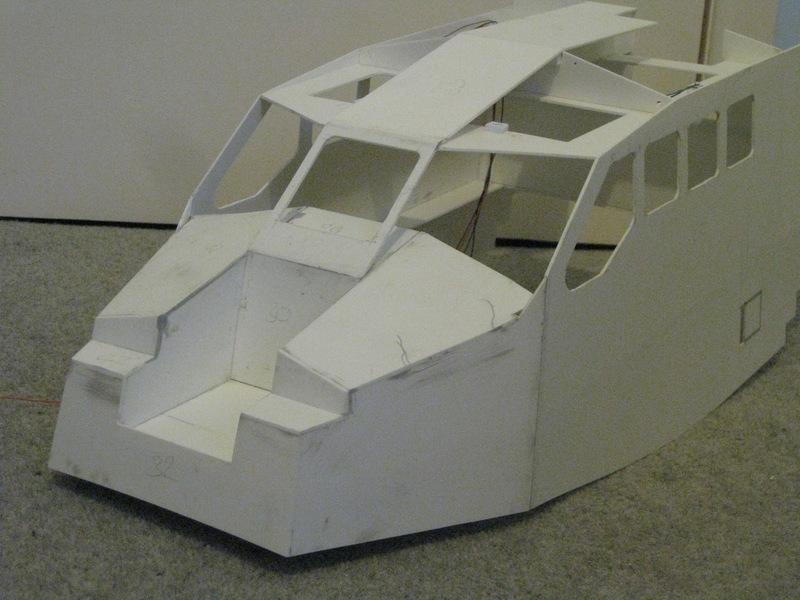 Next up is the cabin roof, flying bridge floor and finishing the front off. I've turned my attention back to the wheelhouse of late. So as to keep my sanity, I've been working on the front and the back! I say sanity because until now the parts have fitted superbly. However, the wheelhouse front parts all need very careful trimming and fitting. Now, the instructions warn about this but it's not an easy task to line everything up and trim correctly. The photo shows the parts and the upright in the front of the shot is marked up with the last of the cuts to be made. It took a couple of evenings scratching my head but I got there in the end. What I can't really fathom though is why all of these parts are oversize to begin with given the precision of the rest of the kit. Model Slipway must have a reason but I can't work it out! On to the back now. I used my Vernier callipers to measure 1.5mm down from the door opening and then marked off a stryrene strip to give me the same level accross the rest of the panel (part 59). The Liferaft canister box fits onto the back of part 58 and I cut the inside of the section to be removed having dry fitted the canister box against it. The CNC cut then gives a positive location for the canister box to fit (NB I have since discovered doing this means part 58 is the wrong way round so don't do this!! 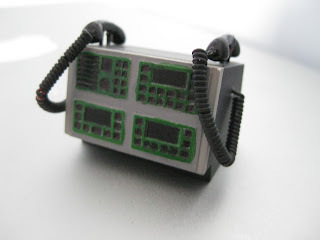 ), though with a little sanding of the box. Having checked my reference photos and plans, I may modify this part but I'm still thinking about that. This photo shows the front of the wheelhouse with only the side windows and one front panel to be fitted, as well of course as the roof. The cabin lights have to go in before the roof though. Also, I've found through test fitting that the side roof panels are slightly over size. Ordinarily, that would be good, but becuase the front side roof panels have a diagonal crease, it's important that they are the right size so that the crease runs accurately from corner to corner. Really, it's another lesson for me that I should test fit parts first - so don't make the same mistake as me as I'll have to cut new parts. Progress has been a little slow of late, but I have, at least temporarily, fitted the electronics. Essentially, this has meant making the servo box and battery trays plus mounts for the ESCs. The main motor ESCs will just be velcroed in place. 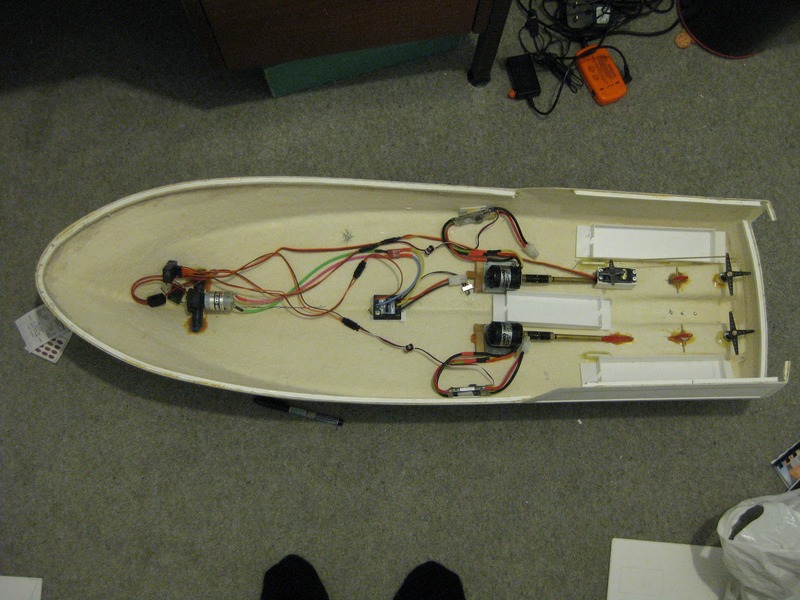 I used an inverse T strip to slide the bow thruster ESC on to as that had worked in the Trent. I need to try moving the battery trays around once the boats finished but they're ok for now. The cables will need a tidy up too. I've also moved into the 21st century and gone brushless. 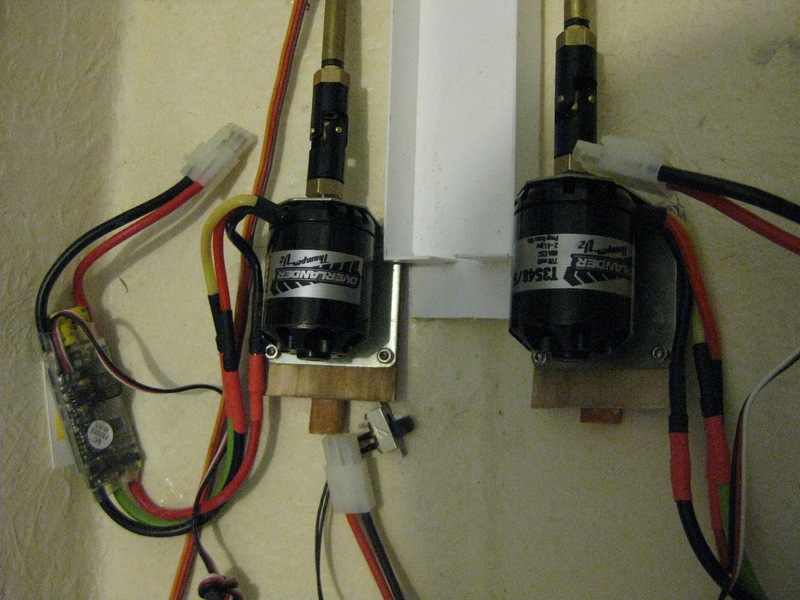 The motors are Overlander 3548/5s with Hawk 60A ESCs. I've fitted 40mm 5 blade props and an using two 9.6v NiMh battery packs. I've no idea yet about run time, but on its first run out the boat was very fast, possibly a little too fast! It was though very responsive and the motors remained cool. That in itself is good news as the Graupner Speed 600 Ecos in my Trent run very hot. So my friend with a lathe has come up trumps. The trim tab rams have been machined and look great. 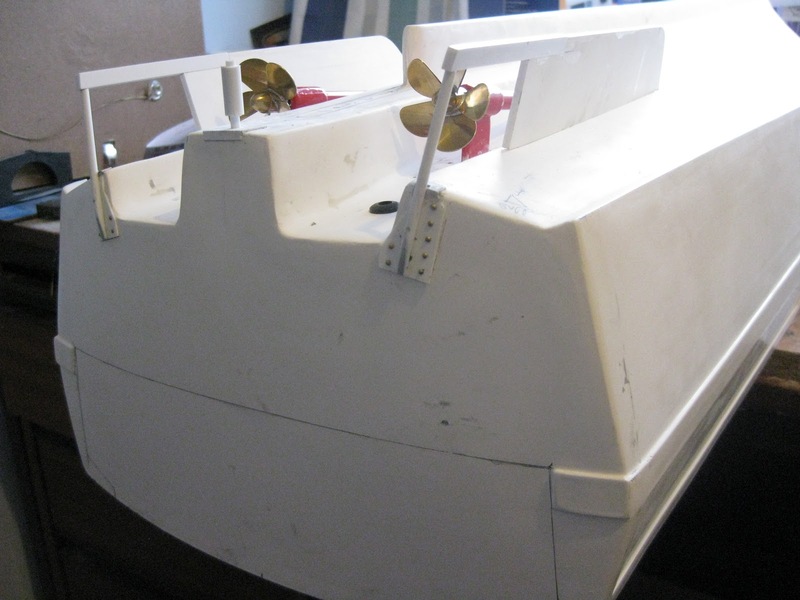 Pic below shows the rams, mounting brackets and trim tabs finished and in place. Water trials next to set the tabs, then the fixing bolts can be choppped down. 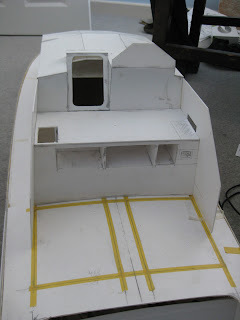 I decided to skip the build order in the instructions and start something new as a little change from my scratch build of the Y boat compartment... so I've started on the wheelhouse. I had thought I'd wait until the side steps were fitted on the deck to help the fit with the wheelhouse but decided it was six and two threes. Now, I have to say it surprised me how quickly the basic parts went together. Having concentrated on the running gear and my mods to the hull, I'd forgotten just how well kits can go together. The fit of the parts is streets ahead of the Trent and shows just what progress Model Slipway have made over the years. Don't get me wrong, the Trent is an excellent kit (it'll be even better if the rumours about a CNC re-issue are true) but the Tamar is just that bit better. Being me, though I have made a few modifications. I had to slightly enlarge the window cut outs to fit the Speedline windows, they're just a couple of mm bigger. Also, the fuel fillers are different on the boats. This meant a narrower cut out and filling the rest of the CNC cut. I'm in two minds whether to modify the kit vac form inserts for this of just make new; that's a decision for another day. 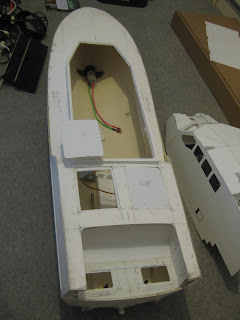 I am now back to working on the Y Boat compartment and transom door. I've joined the flat part of the floor to the sides of the Y boat compartment. This took lots of test fitting and measuring and a 2mm strip added to the sie pieces. Dry fitting so a pretty good fit. I tried using clear sheet (it was the only 0.5mm thick sheet I had) for the curved back of the compartment but it didn't really work so I need to buy some ordinary styrene sheet. 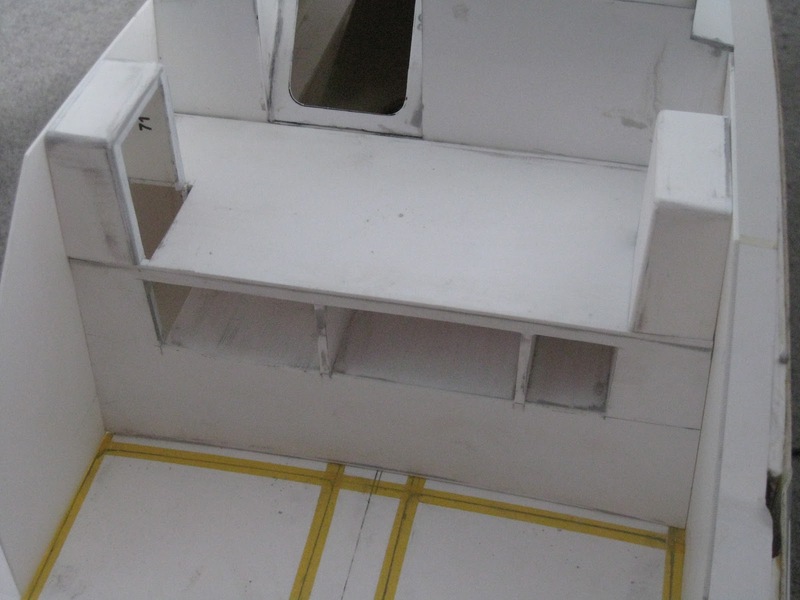 I toyed with the idea of having a removeable floor as per the kit for access to the rudder posts. I couldn't figure out how to make it work though due to the shape of the floor on my version. So, I've gone prototypical and made access hatches in the floor. All shown below with some of the runners attached as well. The transom door is also taking shape. I've used the original hull for the outside and syrene inside. The 3 handles on the inside were made from styrene tube cut in half and 2mm brss rod. These were painted before fitting(see the first photo below). It all seemed to ho together smoothly but once dry disaster. The inside face had bowed in dispite a reinforcing strip inside. I can only guess that as the filler I used on the top and bottom dried, it pulled the inside face in. So, more filler and I now have a near flat surface. A lot more effort than I anticipated but worth it. This is shown below with the various fillers clearly visible! Well some would call it the slipway skid, others the hockey stick and still others the ski. Whatever it's name I have fitted it to the hull. It took a fair amount of filler to blend in and I reckon that priming the hull will show that more blending is needed. For now though, I think it looks good. The support is made up of several diameter styrene tubes, starting at 3.2mm which is glued through the hull, out to 7.9mm. 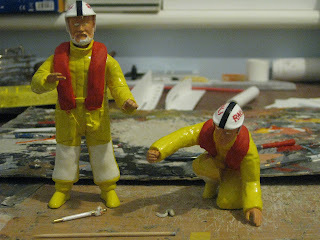 The crew figures for the Trent are getting there too. Detailed painting is underway as below. Next on the to do list is the Transom door. I was going to make the Y boat compartment first but decided the door should be made first. See how I'm getting on next time. It had to happen some time; I've cut out the transom door and deck hatch for the Y-boat. I was a little worried as once cut, any mistakes were going to be trouble to put right. So, I measured and measured again before cutting. The cut lines were covered in masking tape (Tamiya as the marking can be seen through) as it protects the gel coat on the hull and deck. So poised with the cutting disc in my Dremel, I went to work. This photo shows things part way through. I've also started making the parts for the Y-boat recess. These are also shown in the photo along with the door and inside. both need adjusting for width and the transom angle. I used plans from the RNLI for the initial shapes and dimensions. The photo below is with the transom door cut out. Hopefully its accurate enough to use for the door itself. The next step is to temporarily fix the side panels to the floor for test fitting, but that's to come. Having felt like I've done lots of work but with no progress to show, the last week has seen the stern/transom come on leaps and bounds. Well at least I think so. 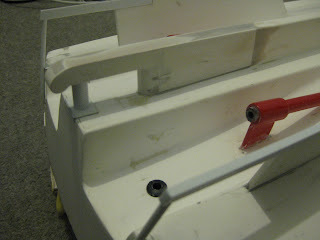 The transon supports are 3.2mm styrene tube with a 1.6mm brss rod inside for which a locating hole was drilled into the keel extentions. The top of the supports are also pinned into the transom with 1mm brass rod. The bolts support mounting plates also act as pins into the transom. It's probably overkill but it makes me feel better! I've also modified the keel extention by adding a rounded profile to the end of the keel (not the 'hockey stick'). It's not quite the right profile but I ok with it and it's better than just the square end. I also got around to fixing the motor mounts. Due to the angle of the prop shafts, there's not much room to fit a mounting so I had to cut down the fixing bolts. Being lazy instead of using a saw, I used a cutting disc (or rather several!). 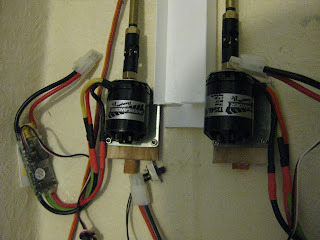 The metal motor mounts themselves are bolted to pieces of thin plywood epoxyed into place with balsa wedges underneath to give the correct motor angle. I was hoping to be much further on with the drive train and hull work by now but due to being a little heavy handed I had a set back. More on that below. However, it gave me chance to finally get cracking on some crew figures for the Trent. They are from Speedline Models and really pretty good. The photo shows the figures assembled (ie with arms attached) and the heads kept separate for ease of painting. All that was required was a little filing of the mould lines, a little filling at the arm joint and an adjustment to the Coxwain's left hand so that it was at the right angle to hold the wheel. I simply cut the hand off at the jacket sleeve, trimmed his wrist to the appropriate angle and superglued back in place. I also dug out copies of a feature by Kim Belcher in Marine Modelling on detailing the 1:12 versions of these figures. He really went to town and I felt much was probably beyond me, like reshaping the helmets. I did though have a go at adding the jacket bottoms and pockets from .0.010" plastic card and I think it looks ok. We'll see after the yellow paint goes on! This photo show the crew figures primered and with some pre-shading in the clothing creases. Not sure it will show through the Halfords spray paint but it might! 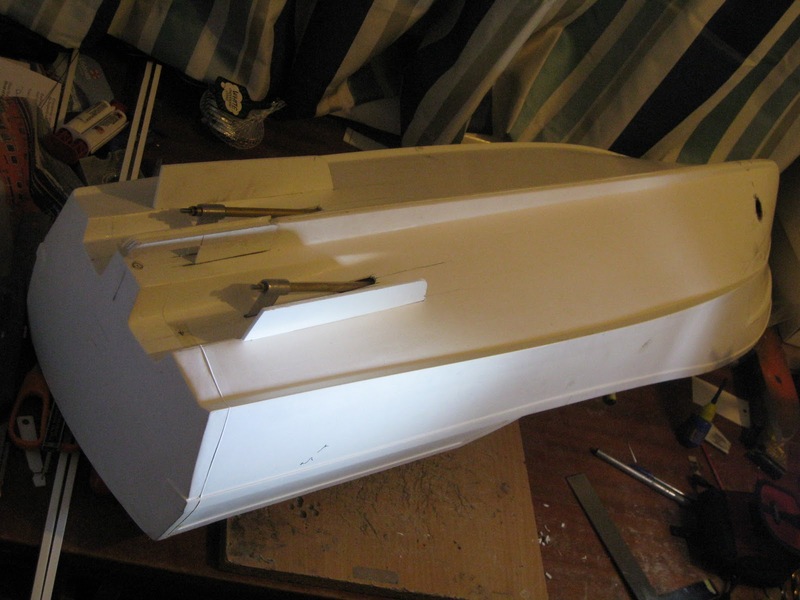 Looking carefully at the hull, I have tacked the prop shafts in place with superglue. These have been measure once but before epoxying them in place I will check and check again. The delay I mentioned came because I like to paint the prop shafts before fitting. With the keel and bilge keels in place it will be difficult to spray paint the tops of the shafts once in place. It might not be necessary but better safe than sorry and it worked on the Trent. However, after the first paint job, my test fitting of the shafts led to a fair number of chips to the paint. Nothing for it but a sand down and respray. 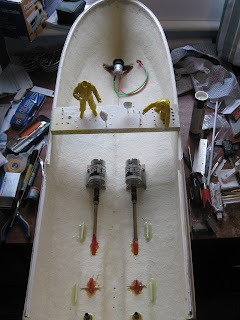 I'm hoping to get the shafts epoxyed in place and the hull filled and sanded flush around them this weekend. I might even get the rudders fitted as well! I've been busy working on the Tamar but there's little to show in photos. That's because I've been fitting the deck support strips, opening up the running gear slots and holes and rubbing down the mould lines and hull in general. A reasonable level of progress but nothing much to look at. Fitting the prop shafts, rudders and bilge keels is next up. So, I've also been busy adding some extra detail to the Trent, which really is all do bar the trim tab rams. 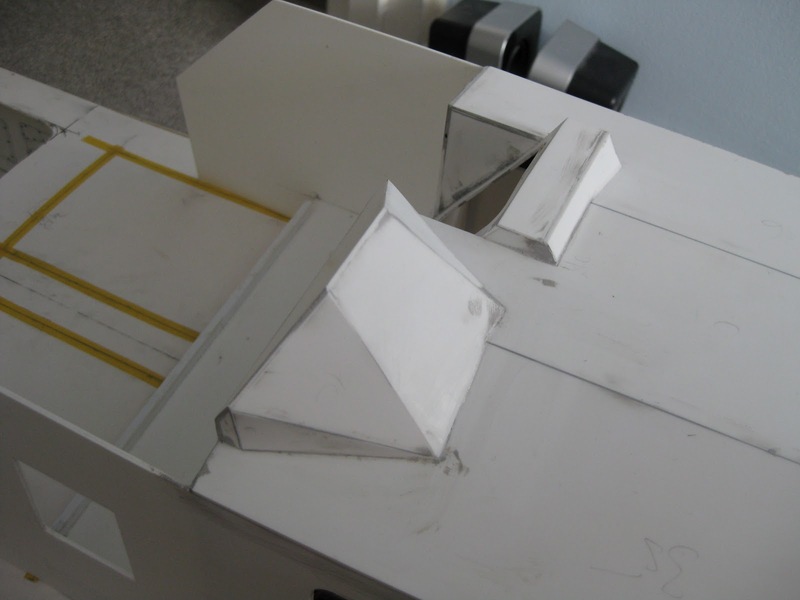 I've made a pair of small vents that sit in the vent boxes on the rear of the wheelhouse and the emergency tiller. Photos or the unpainted and also the finished parts below. 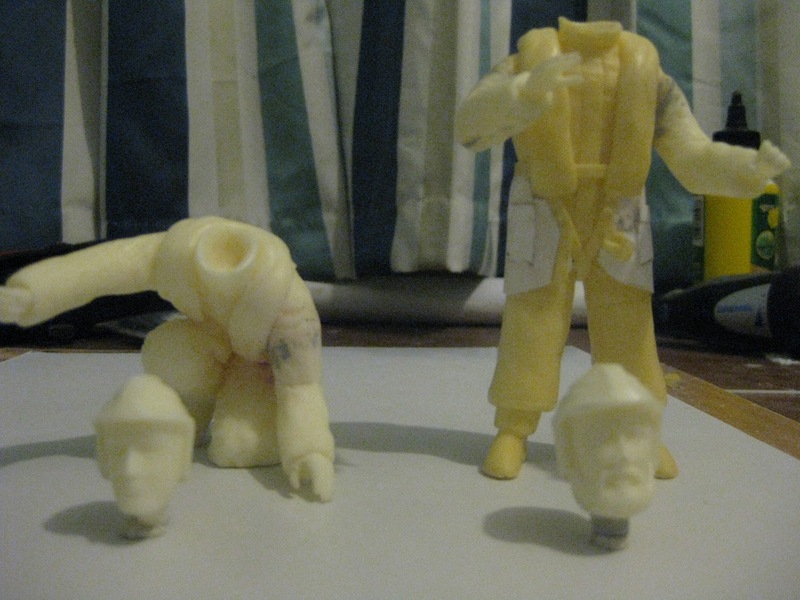 Also working on some crew figures so I'll probably post about those later. I've now completed work on the running gear, except of course for the job of actually fitting it! The photos shows the work I've done and also the rudder parts. The skeg extention is finish and I'me really quite pleased with it. The P38 method has worked a treat. The rudders took a little more effort though. I didn't use the styrene parts in the kit. 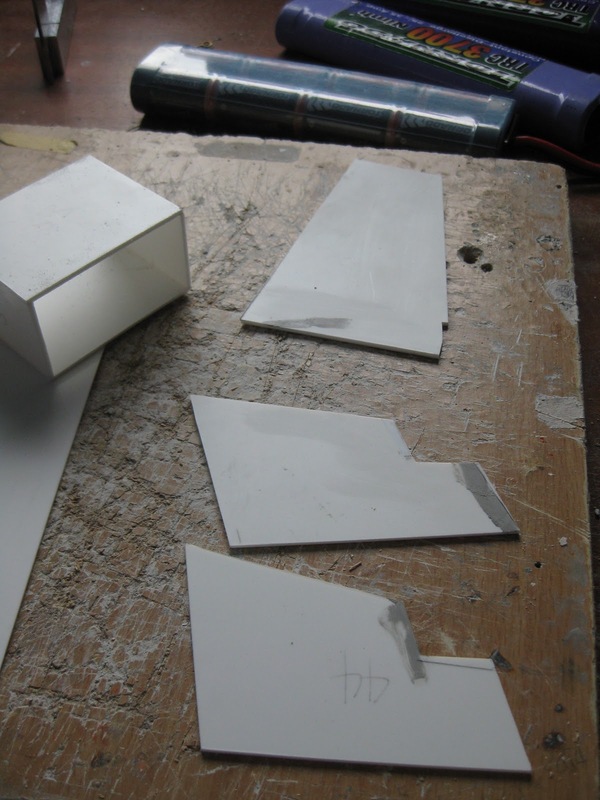 Instead I adapted the method I used to scratch build new rudders on the Trent. So, I glued spacer strips onto the supplied brass rudders, cut new outside skins from 1mm styrene and formed the 'foil shape that way. The void was filled with more P38. It didn't go to plan at first but I think the end result is ok. I've also modified the bilge keels. The boat I'm building has a slightly different bracing for the slipway skids. So, I cut away a 6mm strip and glued a length of 6.4x3.2mm strip on (bought separately as it's not as rough cut as the strip in the kit) as thisi si slightly bigger than the keels, it handily represents the protector strips. 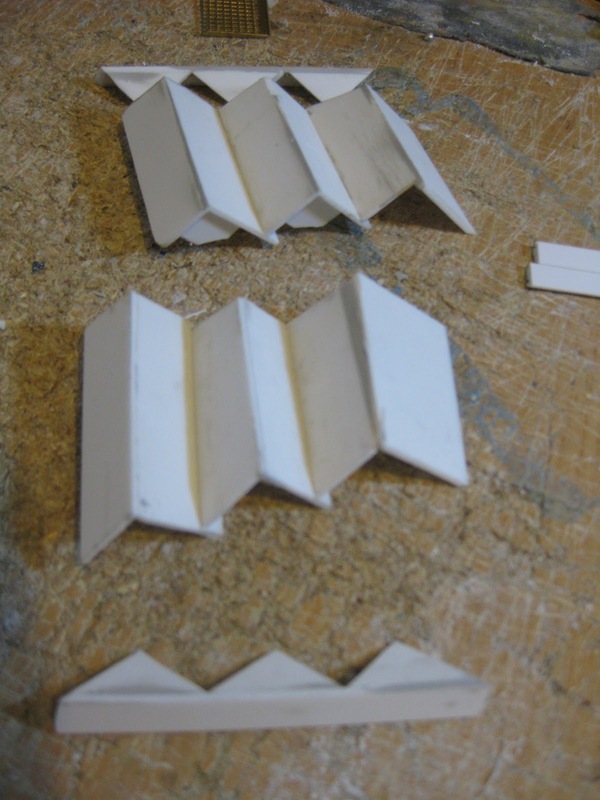 The supports are from 3.2mm tube and the mounting plate on the transom from 0.75mm styrene sheet. The parts were made using photos I'd taken and the plan I got from the RNLI. These will all be glued and pinned over the next couple of weeks, but first to install will be the prop shafts. 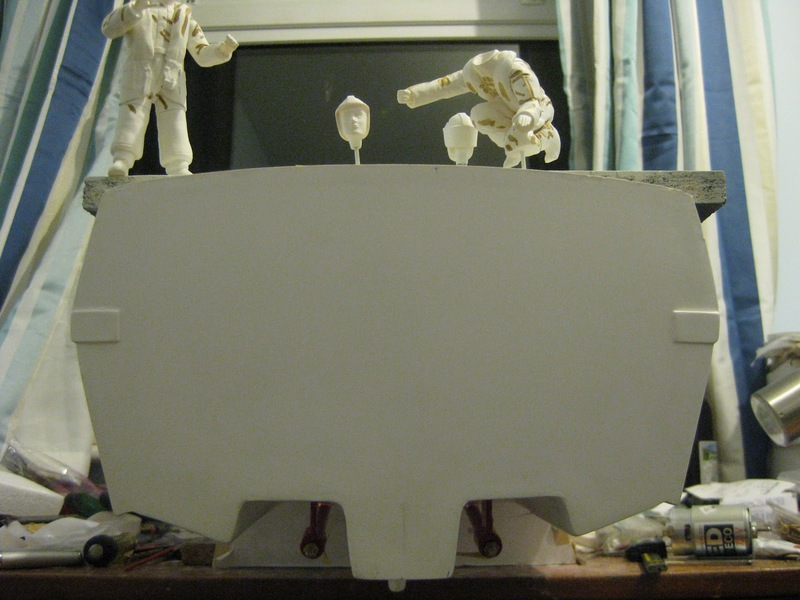 Before that though I have to rub down the mould lines. So the bow thruster is now epoxyed in place - no going back now! I've been busy working on the stern of the hull with the running gear openings. These are now all roughly to size so the next big task is to align the prop shafts. This photo shows how I'm getting on with prop shafts and bilge keels placed but not glued in place. 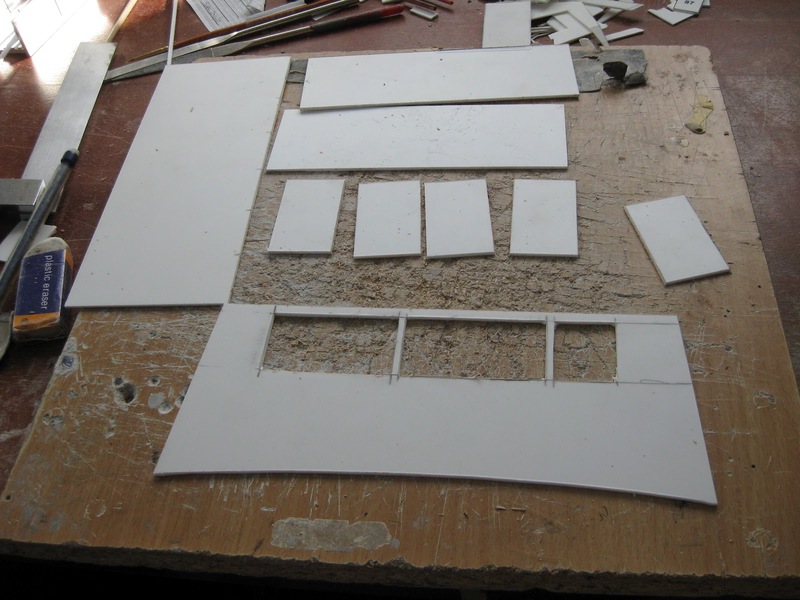 I've also started work on the slipway/tow shoe/keel extension using the kit parts as a template. There are a few mods to be made between the kit and the boat I'm building in this area but all are, hopefully, straightforward. 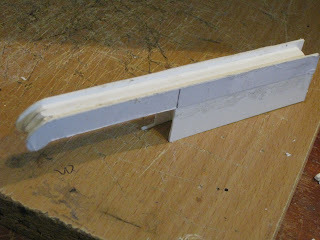 The next photo shows the start of this; each side is 1mm styrene with 3 lengths of the supplied plastic strip between. I'll fill the middle with P38. I considered just making up up with several layers of styrene but thought that would be harder work!